Come with us for an insight into Wanaka’s “must see” highlights. Included is a visit to a 30000 acre sheep cattle and deer farm, exclusive hill-top views over Lake Wanaka and beyond to snow-capped mountains. Enjoy refreshments then a stroll in an alpine meadow. This journey offers Wanaka’s best scenic locations and an unique insight into Wanaka’s rich history, heritage and modern-day farming life. A must if your time in Wanaka is limited, perfect family adventure and photographers dream! Dates of Operation: Sept – April – Winter months on demand and subject to weather. 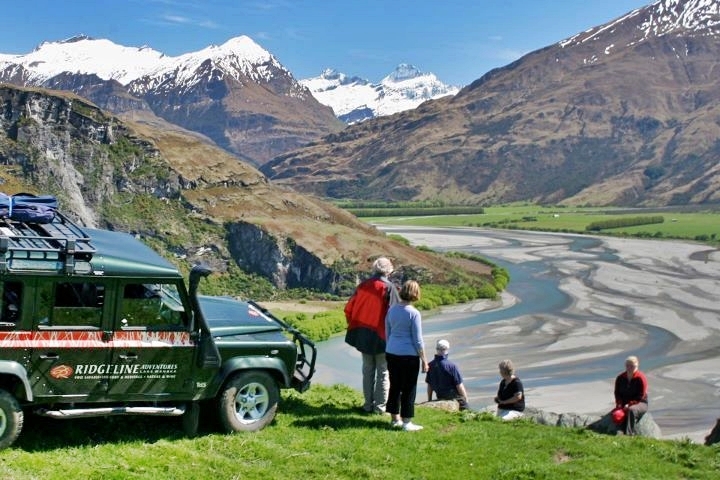 Included: Wanaka accommodation pick-up, 4WD Landrover tranportation. Private farm access, local guide, interpretation of local fauna and flora and Maori and European history and optional nature walk. Morning or afternoon tea.